The 12th - 18th March 2018 is National Home Improvement Week - a week to inspire, celebrate and enable people to improve their own homes. 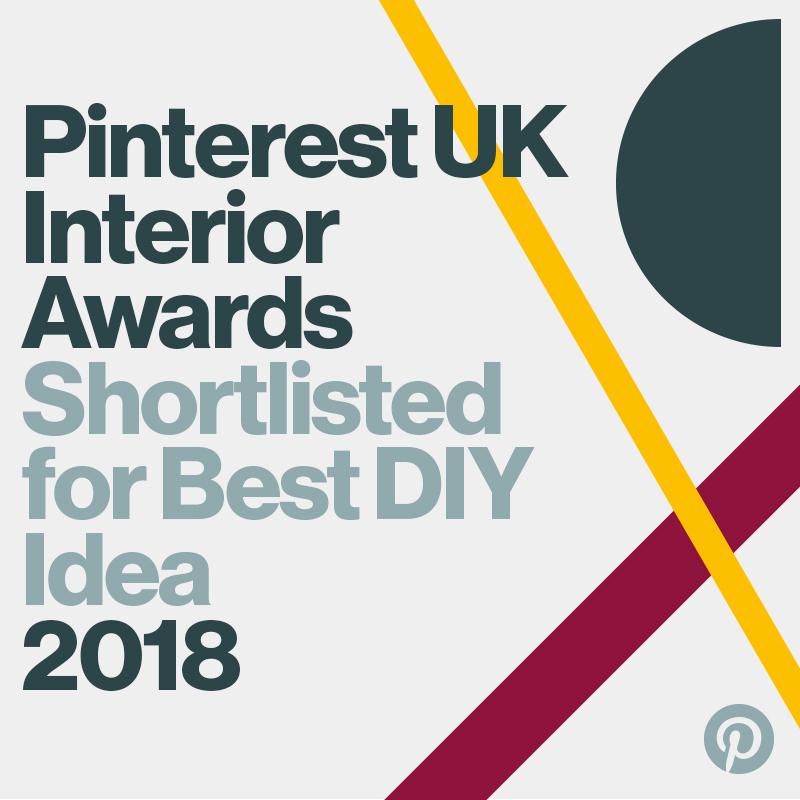 So when DIY & Home Improvement online marketplace Mano Mano asked me to share a great DIY that people could easily copy, I instantly thought of the nursery project that I had recently carried out for one of my clients. Our old range cooker was inherited from the previous owners of the house when we moved in three years ago. To be honest, it was always on its way out - one hob never worked and over time it took so long to cook anything I probably could have gone outside and rubbed two sticks together to create fire to boil a pan of water quicker than the time it took to cook a pizza to a decent standard in that oven. So when it finally packed up completely two days before Christmas (we ended up making roast potatoes in a frying pan for Christmas dinner) it was time to start 2018 with a brand new cooker. 2018 is all about maximalism, luxury and cocooning comfort. In my blog post last week I talked about how peacocks, and the beautiful teal colours associated with them, are set to be a big thing in interiors and decor this year. A client that I am currently working with wanted their hallway painted in a beautiful teal colour. Because of this, the past few weeks I have been researching and testing out numerous teal emulsion paints. I thought I would share with you the best of the teal colours that I found on my hunt for that perfect teal shade, in case you were thinking of going totally teal in your own home! Villeroy & Boch are one of those companies that you know and are aware of, even if you don't really know much about them. Their expertly applied trademark stamp adorns sinks and toilets in an abundance of hotels, restaurants and residential properties all over the world. Since 1743 Villeroy & Boch have been producing ceramic tableware, then, later on down the line, bathroom sanitary-ware, and are one of Europe's most valued and celebrated producers of ceramics and porcelain. So, when they invited me to go and stay with them for a few days at their headquarters in Mettlach, Germany, how could I refuse? I always make a Xmas wreath every year for my front door, but I'm totally self-taught. I just go with an idea in my head and run with it, which is great, but sometimes it is nice to get an insight into just how the professionals do it. When a really great florist makes a wreath, there is often something unexpected in the mix, and you know it will last right through over Xmas without wilting or drying out! Well hello and welcome to this years 'My Home At Xmas!' I can't quite believe it but this year is actually the first Christmas since my living room has been painted blue. The Xmas scheme for 2017 therefore had to match the new walls, so I am delighted to have partnered up with Balsam Hill this year as part of their 'Trees & Baubles' blog hop. A large cabinet or a sideboard can be a tricky purchase. First of all, it has to be the right piece as it will be a large dominating piece of furniture that won't be interchangable from room to room like rugs or lighting can be. They also tend to be expensive, so it's crucial that you choose the right sideboard first time. The trouble is, Google 'sideboard' and you are presented with a lot of oak or pine monstrosities. There never appeared to be a lot of choice when it came to getting a well-designed sideboard, so often there is a reliance on picking up a vintage G-Plan on Ebay. Yet in the past year I've seen some amazing sideboards become available. Here is my pick of the ten best sideboards that you can purchase now, either online or in-store. Holiday House London is two ginormous Maida Vale mansions, right next door to each other, which have been completely transformed inside, top-to-toe, by some of the worlds leading interior designers. The mansions act as showhouses for the elite designers, plus some of the best lifestyle brands, to showcase their product and talent. The houses are then opened up to the public, and all money raised goes towards the prevention and cure of breast cancer. You'll agree that this is an excellent idea and a very worthy cause, but I am going to be completely honest here - I had heard of Holiday House London, but it wasn't something that I thought I would be interested in. I totally wrote it off as a big rich fundraiser for big rich people to showcase the sort of interiors and design that decked out a Kensington pied-à-terre, or a home in upstate New York. When interior-blogger pal and professional interiors stylist Maxine Brady from We Love Home recently visited my house to style it for a magazine photo shoot, it was so interesting to see how she personally styled my home. It is easy to fall into the trap of 'getting used to' our decor and home ware items - everything has a 'place' - so it is really helpful to have a fresh set of eyes come in and shake things up! I was amazed at how Maxine added a few new pieces, or styled things differently, and completely transformed the space I was so used to seeing everyday. Have you seen the front cover of Living Etc magazine this month? It completely caught my eye as it features two beautiful statement red velvet bespoke chairs from The Sofa & Chair Company against a beautiful grey-blue wall (painted in Scree by Little Greene). After the Revamp, Restyle, Reveal bedroom reveal, I've had loads of questions about where my new large brass-trim dressing table mirror is from. The answer is it's actually a DIY job and it cost me £9.37 in total! So, today on the blog I am going to tell you how I made it. Want to be the first to know when there is a new post? Sign up here! My Garden Overhaul: The Trex Transcend Composite Deck REVEAL!! !